Sekar Speaks: Visaaranai : Battle between mind and heart! Visaaranai : Battle between mind and heart! Only few films in global cinema cease the intelligence of the viewers and tug their heart harder that there would be no time to think but only to feel and cry for the characters shown on the big screen. Visaaranai is one such film, where you know that there won’t be any happy ending yet your heart yearns for it! As a regular follower of Tamil cinema, I’m pretty much aware of the fact that Visaaranai is based on the novel (Lock Up) written by Chandrakumar so my mind should have told me there is no chance for Pandi (Attakathi Dinesh) to escape from the cold-blooded cops as the lone survivor in the brutal execution is the author himself. But as I said, Visaaranai tugs our heart big time that there is no time for the useless intelligence. Films like Interstellar, Inception or Vishwaroopam would give all time high for movie buffs as they would be decoding the film and explain the finer details to their friends. But while watching films like A Separation, Children of Heaven or Mahanadhi, the plethora of emotions would move us deeply that we might shamelessly end up shedding tears. 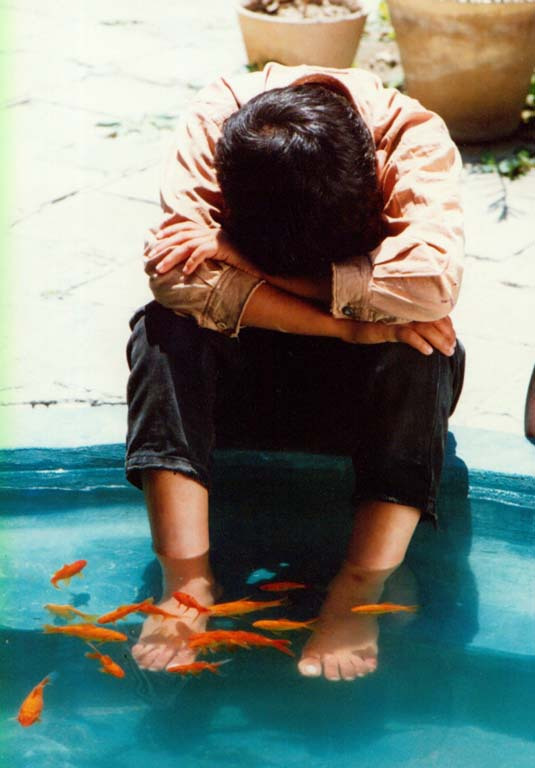 It doesn’t mean Children of Heaven / A Separation don’t have any metaphoric scenes—nothing can match the climax of Children of Heaven with the Ali & Fish. In the same way, the guiltiness between the two couples in A Separation can’t be decoded or raved in words but one can only feel with their whole heart, Visaaranai is one such film! In fact, for me Visaaranai is India's answer to The Secret in Their Eyes. 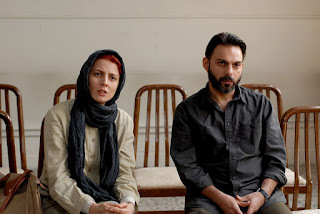 Both the films deal about the loopholes in the system and how it affects two protagonists! 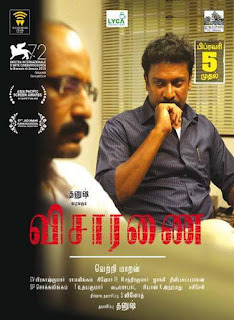 Visaaranai is nothing but an authentic documentation of what has happened real/ what Chandrakumar had written. But still there is a cinematic nuance and ironies coexist beautifully in the movie. The film satirically tells us that the brutal cops would treat both the poor and rich in the same way. At the first half of the film, we begin to think that Pandi and his friends are undergoing such unbearable physical tortures because they are care of platforms and they don’t have enough money and education to stand against the system. But the irony is a wealthy auditor KK (Kishore), who possess a respectable degree too becomes a prey for the greediness of the cops. This paradox lies within the ecosystem designed by the ultimate creator. I’m not writing much about the grey shaded characterizations of the cops and the purist Pandi as all the characters existed in real life. The solid characterizations have indeed contributed big time for the cinematic excellence but whom should I appreciate? Vetrimaran or Chandrakumar? May be, I should curse the ultimate creator as the innocent human beings were mercilessly tortured and lost their lives. Kudos to Vetrimaran and Chandrakumar for registering the barbarity of the cops and how they are escaping through the loopholes of the system. In a state like Tamil Nadu where the reach of cinema is powerful than novel, the screen adaptation of Lock Up is an eye opener and I’m sure Vetrimaran’s genuine effort in Visaaranai will be discussed for many years!